Site of a former death camp in Poland which gained particular notoriety because it was the place where the Nazis conducted "experimental" gassings which were later transformed into mass extermination, all in preparation for, and then as part of, Operation Reinhard. More background info: Chelmno, or Kulmhof in German, was a kind of precursor to the purpose-built pure death camps in the East (Belzec, Sobibor and Treblinka), but it was in operation for longer than any of those, namely from 1941 to 1943and again from 1944 until January 1945. The scale of the mass extermination wasn't that far off that of Sobibor either: in total over 150,000 people were murdered at Chelmno (possibly as many as twice that number), primarily the Jews of Lodz and the surrounding region, but also Roma and Soviet POW. At Chelmno gas vans were first used to kill the victims, in batches, namely by means of carbon monoxide/exhaust fumes (cf. also Sachsenhausen). While the initial gassings may only have been "tests" for the perpetrators, the outcome for these victims was just the same as for later victims: death. The origins of gassing as the Nazis' preferred method of murdering their victims go back to the Aktion T-4 euthanasia programme (see esp. Hadamar and Hartheim). When Germany invaded Poland in September 1939 at the beginning of WWII, the initial killing sprees perpetrated against select victims were mass shootings by the Einsatzgruppen. But as the Holocaust was getting into full swing with the mass incarceration of Jews in various ghettos and concentration camps, and plans evolved for the total extermination of Poland's Jewry, other methods were being considered – and “tested”. This is when Chelmno entered the scene. The Nazis appropriated an empty 19th century manor house in the small village of Chelmno-on-Ner, built a fence around it and turned the complex into the first pure killing centre, or 'death camp'. The choice of the manor house was apparently inspired by the similar properties of the Pirna-Sonnenstein euthanasia centre. But while at those centres gas from pressurized gas cylinders was used, the Nazis now introduced the newly-designed “gas vans”. These vans were based on regular lorries but were specifically adapted by a company in Berlin to seal the cargo compartment and make it airtight – i.e. turning it into a mobile gas chamber. They could hold 50-70 victims at any one time. The victims carted to the complex were told that they were being deported to perform forced labour in the Third Reich and that they had to take a shower and be disinfected before their departure. So they were made to undress (their possessions later taken, sorted and redistributed) and then herded through a corridor into the back of the van, which had been reversed onto a ramp at the side of the manor house. The van's rear hatch was then closed and sealed and a hose connected to the van's exhaust. With the engine running the victims would die in agony from asphyxiation. The van would then drive the short distance to another plot of land appropriated and fenced-off for the purpose, but this site was deep in the Rzuchów forest a couple of miles from the village. Here mass graves would have been been dug, so the “load” of corpses brought in by the vans could instantly be dumped into them. The systematic mass murder by this method began in late 1941. The “efficiency” of this process was mentioned and praised at the infamous Wannsee Conference in Berlin in January 1942, and so the method of gassing developed at Chelmno was decided on at the conference that brought the so-called “Final Solution” on its way. Soon after the method was adapted and perfected at the three purpose-built death camps of Operation Reinhard, as well as at Auschwitz and Majdanek. Chelmno's own role in this did not stop either. In fact operations intensified here too to an industrialized scale. The majority of victims were brought in from the ghetto in nearby Lodz (the second-largest such ghetto after Warsaw's), where some 160,000 Jews were housed. During 1942 the majority of Jews from this ghetto were deported by freight trains from Radegast station. The trains went to the town of Kolo, from where the victims were transferred by narrow-gauge railway to a station near Chelmno and from there by van to the manor house/camp in the village, where the “tried-and-tested” method described above commenced. At one stage, there were also crematoria used to burn corpses at the Rzuchów forest mass grave site. By September 1942, the main operation of the Chelmno killing machine was over, but it was still used on a smaller scale until early 1943. In April 1943, the Nazis blew up the manor house and razed it to the ground and the fence around the site was dismantled so as to leave no trace of the “killing factory” it had been. This ended the First Phase of the camp. Similar cover-up efforts were applied at the three death camps in the east of Poland. In contrast to these, however, Chelmno is unique in that it was brought back into action in a Second Phase in mid-1944, namely when the Lodz ghetto was liquidated, i.e. its remaining inhabitants were condemned to death too. Those destined for Chelmno (others were taken to Auschwitz) were now sent straight to the “Waldlager” where two barracks had been constructed to receive the victims – since the original manor house had been destroyed. However, some groups of victims were also held in the village church opposite the former manor house for the night before being transferred to the forest. Also at its original site the former granary had not been blown up and was now used to house camp workers, also mostly Jews, whose task it was to sort through the belongings of those killed in the gas vans. As temporary storage a barrack and a large tent were erected too. At the “Waldlager”, meanwhile, two additional crematoria were installed in the forest clearing to burn the corpses of the dead. This Second Phase was short, and by August that year the dismantling and cover-up of the Waldlager commenced. As part of a special operation (Sonderaktion 1005), the bodies of the victims were exhumed from the mass graves and also cremated to cover up evidence of the mass murder. A bone-grinding machine was used as well (see War Museum, Kiev). Sacks of ash were also driven, under cover of the night, to the river and disposed of there. The last few Jewish workers who were forced to help in this cover-up still stayed at the granary in Chelmno until January 1945. As the Soviet Red Army was advancing fast from the east, the Nazis decided to kill these last Jews as well. A few put up a fight and managed to overpower two of their guards, whose weapons they took, and a gunfight ensued. However, the Nazis bolted the granary building's doors and set it on fire. The blaze killed all inside. Just one day after this final atrocity at the Chelmno granary, the Soviets arrived to liberate the area. Only between six and nine (depending on which source you rely) members of the Jewish work commandos are said to have escaped from Chelmno and survived. Some of these later gave accounts of the camp operations and a couple of them testified in trials against the perpetrators. Investigations into what had happened at Chelmno began immediately after the war, and initially there was much interest in this. However, this interest soon ebbed away and by the mid-1950s the site had become almost forgotten again. A first memorial marker was erected at the manor house site in Chelmno in 1957. However, the site was by then mostly put to new uses by a local farmers' co-operative. In the 1960s more efforts to commemorate the historical significance of Chelmno resumed and in 1963-64 the main typically communist-era memorial monument in the forest of Rzuchów was constructed. Some of the forest area was also cleared and the locations of (part of) the mass graves were marked. In the 1990s, after the fall of communism in the Eastern Bloc, the farmers' co-operative was closed down and the complex at the former manor house at Chelmno village was declared a Historic Monument. Here as well as at the Rzuchów forest site more archaeological research resumed and new memorial stones/monuments were added. Some work is still ongoing, in particular the restoration of the old granary building next to the former manor house location – which is the only surviving original building of the complex. This, I gathered, will eventually house a proper museum. A first small museum had opened at the Rzuchów forest site already in 1990, but this has meanwhile been closed. Standing in for this at the time I visited in August 2016 was an open-air exhibition of historical information panels next to the granary building. So Chelmno will have to be monitored for yet more developments over the next few years, and I hope to go back there one day. B) the archaeological site of the foundations of the manor house in Chelmno-on-Ner village itself, i.e. the place where all the gassings took place during the First Phase of Chelmno. Here a new museum exhibition has been added to replace the earlier small museum at the forest site. At the site in the forest, there are several different locations spread out over quite a large area. 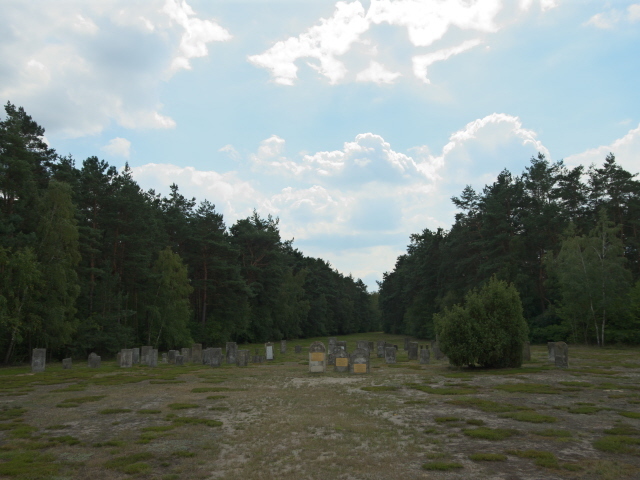 This area covers the locations of all the mass graves the Nazi had dug here – and that alone gives you a chilling indication of the magnitude of the mass murder at Chelmno! At the car park by the road are a few information panels that give a very brief outline of the history of the place and provide a plan of the site for orientation. You can also see a short stretch of camp fence ending by the road – though I have my doubts it can be original. To the right is a low building that used to house the on-site museum that was set up in 1990. But when I got there in August 2016 I found it closed. There was a workman who spoke only Polish, with much gesticulation, which included pointing up the road, and I understood : it has moved to the village of Chelmno. At least I was able to use the toilets of the former museum. The largest component of the Rzuchów forest site is the old main memorial monument from the 1960s in the centre of the first clearing. It's a typical communist-era, concrete-brutalism affair – a style that tends to divide people: some hate it, others like it. I am personally quite fond of it but my impression was that the people who run the site must be in the other category, as it looks badly neglected. The whole structure looks like a big slab that appears to be hovering about two metres above the ground, thanks to some clever pointed columns that are hardly noticeable in the shade underneath. The front of the big concrete slab is still quite intact: the main element here is a large bas-relief that semi-abstractly depicts the agony of victims en route to the gas vans. Next to this, on a clean concrete front, appears the single word “Pamietamy” ('we remember' in Polish). On the rear, five lines of text in Polish were barely legible any more. The whole monument was also fenced off, so you couldn't approach up close to it, let alone walk under it. Maybe it is undergoing some refurbishment work or will undergo some in the future. I don't know. The text on the rear is apparently a quote from a proclamation by one Izaak Zygelman made shortly before the camp was liquidated, so the guidebook I bought at Chelmno informed me. The book doesn't give a translation into English, but remarks that the inscription was “falsified” in so far as important lines were omitted. In the communist era, the victims were considered an unspecified mass, just victims of Hitler's fascism, without giving nationalities or mentioning that by far the majority of them were Jews. It's the same at many Holocaust-related monuments in the former Eastern Bloc. In front of the main monument is a newer addition that looks like a combination of a memorial monument and an altar. To the south of it is the so-called “lapidarium”, which looks just like a Jewish cemetery, though the headstones were moved here from a different location (Turek) and are a more general monument of Jewish heritage not directly related to the camp. Very much related to it, in contrast, is the bizarre wooden “bridge” that you approach when moving further into the forest site. It doesn't seem to bridge any gap or so, but a sign informs visitors that it was discovered that the concrete path laid out in the 1960s when the site was constructed inadvertently cut straight through the location of an early mass grave that was only discovered later. So the bridge was constructed out of respect for the victims, so that one doesn't have to step onto the mass grave. All around and along the path there are several memorial stones that have appeared mostly in recent years and are dedicated to various individual subgroups of victims or specific ghettos. One of the oldest stones, however, goes back to the 1960s and is dedicated to the Czech children who were murdered here – in particular those taken from Lidice as part of the brutal retribution operation by the Nazis after Reinhard Heydrich's assassination. A path branching off to another, smaller clearing to the south takes you to the second site of a mass grave, with just a modest little memorial stone. Back on the main path you eventually approach the largest clearing in the forest here. A lone Star of David on a metal pole overlooks the area from where the path meets the open expanse – and this is in fact the very oldest memorial element here: it dates back to 1957! Spread out over the clearing area are several marked patches where mass graves and burn pits used to be located. Also marked are the locations of the crematoria and the bone grinder. The only actual relic still to be seen here are some concrete fragments of the crematorium used during the First Phase of the operation of the Chelmno death camp. At the far end of the complex is a long concrete memorial wall with a symbolic gate in it with a Hebrew inscription above it, a Polish line to the left and the years 1941-1945 to the right. Along the wall various individual plaques have been attached. Dotted around, especially along the eastern path are yet more memorial stones and monuments added in relatively recent years (in the 1990s or 2000s). These too are dedicated to murdered Jews from specific places, including Lodz (i.e. the largest group by far). From here you should then head back to the car park and make your way to the other site of the two places that together make up the Chelmno memorial, namely that at the actual village of Chelmno-on-Ner (in Polish: “Chełmnie nad Nerem”). This was the site of most of the actual killings at the so-called “Schlosslager”, where the manor house used to stand (see background). Since the Nazis blew it up in 1943 to cover up their crimes, there's very little left to see today, just some remnants of the foundations of the former building. A sign provides a little info about the history of the building and a plan (in Polish only) indicates the layout it had, including where the ramp for the gas vans used to be. Opposite the former manor house one of the “Road to Death” memorial stones from the 1990s can be found. Another one is in front of the neighbouring church a hundred yards further down the road. The main relic at the “Schlosslager” site is the old granary building (see background). When I visited Chelmno in early August 2016 this building was undergoing extensive refurbishing work (including a new roof). It was thus not accessible as such. But I presume that once the work is finished this will be where the new Chelmno museum will be housed to replace the one at the Rzuchów forest site. Right next to the building was a cluster of information panels that I presume were put up as a kind of stand-in open-air exhibition to fill the commodification gap until the granary building refurbishment is complete. The text-and-photo panels were all bilingual (Polish and English) with an OK translation quality, though not perfect. Yet it certainly provided a lot more background information than anything at the Rzuchów forest site. Dotted around are also some individual marker plaques that point out where various parts of the Chelmno death camp complex used to be. Some of these signs were quite faded and difficult to decipher. There is also a visitor service point where you can find plans of the sites and other useful bits and pieces – in particular the small but excellent new guidebook to Chelmno by A. Grzegorczyk and P. Wasowicz whose English translation (of very good quality!) is entitled “Kulmhof Death Camp in Chelmno-on-Ner – A Guide to a Place of Remembrance”. Despite its title it also extensively covers the Rzuchów forest site as well and generally has a wealth of information in relatively condensed and easily digestible form. All in all, then, Chelmno as a memorial site has been improved a lot over the past two decades or so (and especially between 2005 and 2013, with the help of EU funds), and more is still to come – especially when the granary refurbishment and the new museum are finished. Yet, compared to some of the other memorial sites of similar magnitude it still looks perhaps a bit meagre. There just isn't much, well: hardly anything authentic at all left to see for visitors. To be fair, the same is also true of the sites of the three Operation Reinhard death camps, though at Belzec they at least added an excellent museum to the completely redesigned memorial site. I guess when the Chelmno museum is finished it could be a bit closer to the quality of commodification of the Belzec site. And it is already definitely ahead of the forlorn and almost forgotten state of Sobibor. Location: roughly 45 miles (70 km) west of the district capital of Lodz, which itself is a good 75 miles (120 km) south-west of Warsaw. Access and costs: a bit remote, but quite easily reachable by car; free. Details: the old main memorial, the mass graves, and newer memorials in the Rzuchów forest are to be found by the 473 road between Chelmno village and Kolo (note that there are other Chelmnos elsewhere in Poland! ); it can be reached fairly easily by car from the nearby motorway A2: exit at Dabie, and in Dabie turn left to stay on the 473, proceed beyond Chelmno village towards Kolo. The site is on your left (but a marker to the right side of the road also indicates the entrance). The distance between this site and the village is just over 3 miles (5km). There's a small car park right by the road (free), the open-air memorial area has to be explored on foot (but is also mostly wheelchair-accessible). In theory, the site is openly accessible at all times during daylight hours (it would hardly make sense going there in the dark). At Chelmno-on-Ner village itself, the memorial complex is to be found right next to the large village church, which is impossible to miss. The entrance to the memorial is less than a hundred yards to the north-west of the church, right by the 473 road. This complex is gated and has the following opening times: Tuesdays to Sundays from 9 a.m. to 5 p.m. between 1 April and 30 September, in winter only open to 3 p.m.. Closed Mondays. Admission to both sites is free. Time required: I spent about an hour at the memorial complex at Rzuchów forest and about another half an hour at Chelmno village. But, especially if you're not a fast walker and/or reader, you might need longer than that. The most obvious option in the (relative) vicinity has to be Lodz, not just geographically, but also because there are various sites in that city that have a direct historical link with Chelmno, especially Radegast Station. Much further away, but thematically related to Chelmno are the three death camps in the east of the country: Treblinka, Sobibor and Belzec. Outside Poland itself, the House of the Wannsee Conference in Berlin and the T-4 memorial sites in Germany (and one in Austria) are of relevance in the same context. Combinations with non-dark destinations: nothing much in the vicinity – but see under Poland in general, and in particular Lodz.